Creamy and crunchy Blue Cheese Bacon Coleslaw is the perfect tangy/salty side dish for any grilled meat. It’s also fantastic as a topping on burgers and hot dogs and even on tacos. A little red cabbage and shredded carrot mixed in with the green cabbage gives some color. Sometimes just a basic Buttermilk Coleslaw is what’s called for. Other times you want something a little more original. 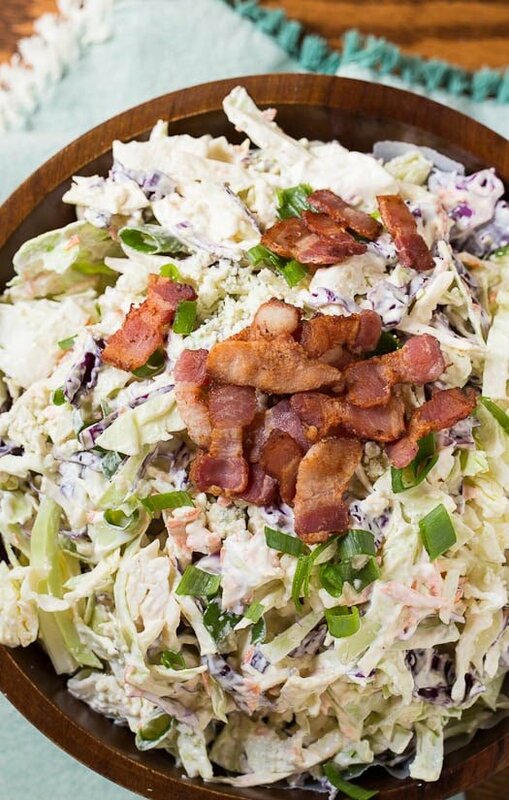 Caesar Coleslaw and this Blue Cheese Bacon Coleslaw fit the bill when you want a unique and extra tasty slaw. I like to use fresh cabbage for coleslaw instead of the bagged mix. It’s worth the few extra minutes. The taste is much better and you get more for your money. I love a combination of sour cream and mayonnaise for coleslaw. Together they are so creamy and rich and the sour cream gives just a little tang. Since it is apple season, you could try adding a julienned apple for a little extra crunch and a touch of sweetness. It ALWAYS goes well with blue cheese and bacon. Add them just before serving so they stay crispy. 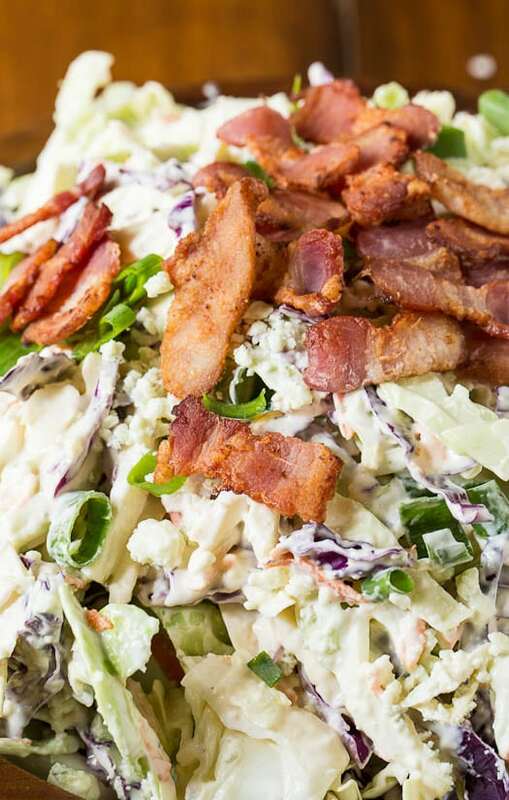 Tomorrow I’ll be sharing a delicious way to eat this Blue Cheese Bacon Coleslaw. 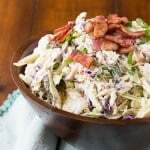 Crispy and creamy coleslaw flavored with blue cheese and bacon. Whether eaten as a side or a topping on a burger or hot dog, this slaw will add tons of flavor to your meal. Cook diced bacon in a pan until crisp. Drain on paper towels and reserve. Combine green and red cabbage and carrot in a large bowl. In a medium bowl, mix together sour cream, mayonnaise, garlic powder, onion powder, sugar, and salt and pepper. Add about 1/2 the dressing to the cabbage and stir to combine well. Keep adding dressing and stirring until all the cabbage is coated well. You may not need all the dressing. Stir in blue cheese crumbles and green onion. 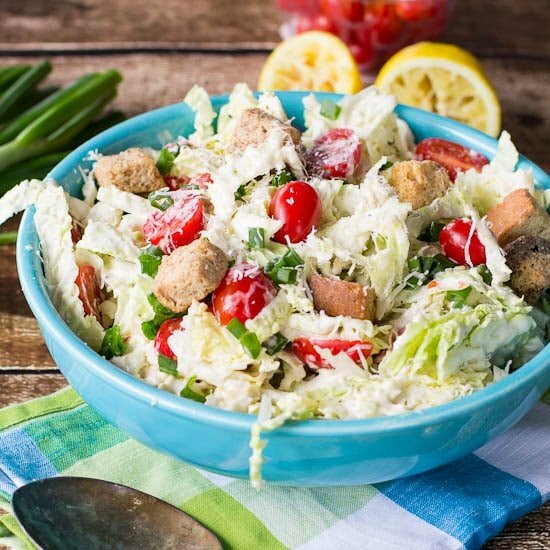 This Caesar Pasta Salad is also great for Picnics! This entry was posted in Side Dishes and tagged bacon, blue cheese, cabbage, coleslaw. Bookmark the permalink. Totally loving the idea of adding bacon to coleslaw.. I can imagine how enhanced all the delicious flavours must be! Thanks for the great recipe.. you can consider that I will be making it! This looks fantastic! We are going to a potluck this weekend and this would be awesome! The bacon and blue cheese sounds amazing and apples would be really good in here too! I never knew coleslaw could be so versatile! I really disliked it growing up because the store-bought versions my family would pick up for parties were awful. Now that I’m older I’ve finally learned the secret wonder of homemade slaw, and how on earth could I resist blue cheese and bacon?! 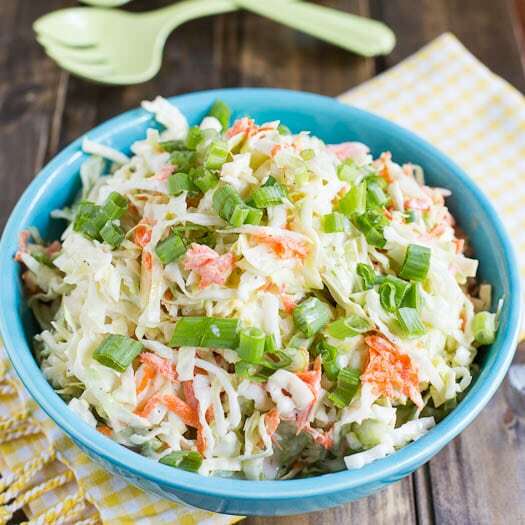 Love this twist to traditional coleslaw! The addition of bacon is perfect! This sounds so awesome!! I love, love, love blue cheese and I agree that it goes GREAT with the sweet apple and salty bacon. This is much more fun than your typical boring slaw! I love putting coleslaw on burgers and sandwiches. It’s like adding the crunchy lettuce and lettuce all at once. This sounds delicious! Coleslaw and bacon??? I would never have thought of that! yum! 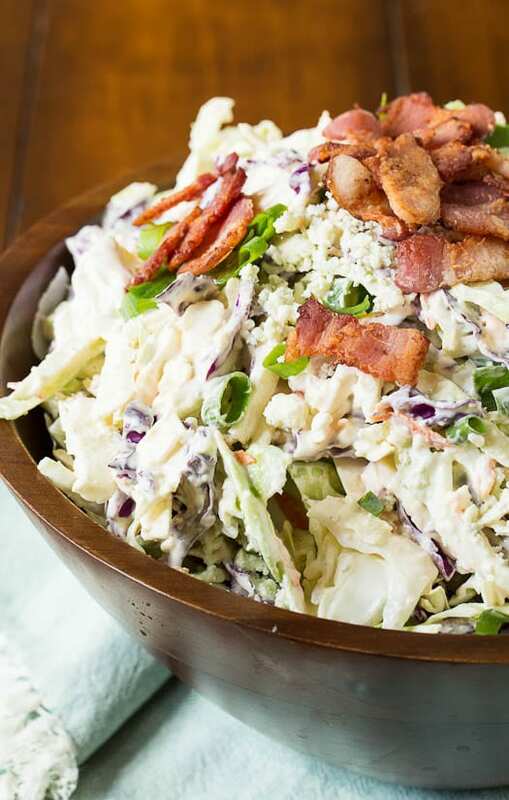 Bacon and blue cheese sounds like the perfect addition to coleslaw! Such a delicious flavor, Christin! Blue cheese and bacon, coleslaw re-invented! I think bacon makes this great salad even better! WHY haven’t I ever thrown leftover bacon in my coleslaw?! That sounds totally awesome with the blue cheese. Yum! I was just thinking yesterday about how it’s been too long since I’ve made coleslaw. This sounds fantastic with the bacon and blue cheese … and I love the idea to add some apple! The coleslaw sounds amazing! I am not sure about blue cheese though since i never got to taste it. My motto is, bacon makes everything better! Even coleslaw! I love your interesting twist on this classic side dish. I also love coleslaw on a grilled bratwurst, yummy! Wow! Christin I want some of that coleslaw on a burger right now. Awesome twist on coleslaw. Bacon and blue cheese? Yum!